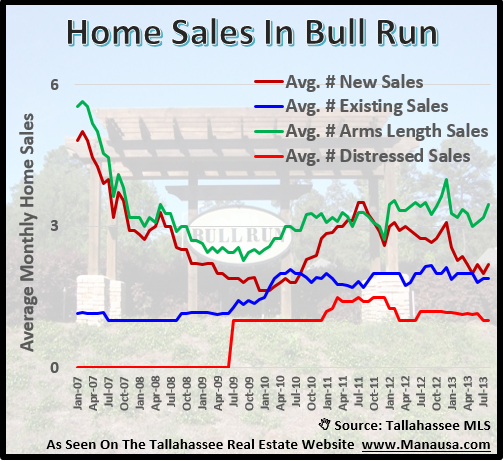 Bull Run home sales are going strong, and if the year to date pace of home sales continue, it will be the best year ever recorded in the Tallahassee MLS. Currently, if you want to buy a Bull Run home, there are 23 available for sale right now in the MLS. Of course, they are still building more, but as this report will show, builders are going to be seeing a tougher time building a Bull Run home for profit. 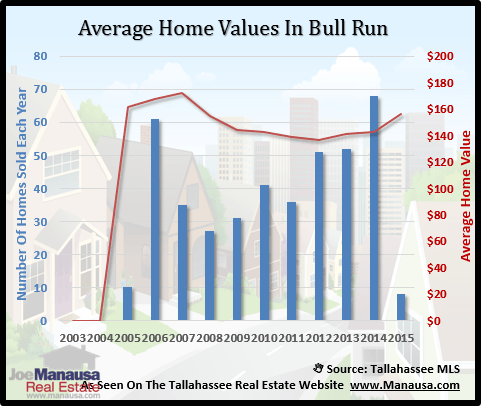 The average price of a Bull Run home sold in 2012 has been $284K, down 30% from the $407K average recorded in 2005. Bull Run home values have (appeared) to only decline 21% since the peak of the housing market. 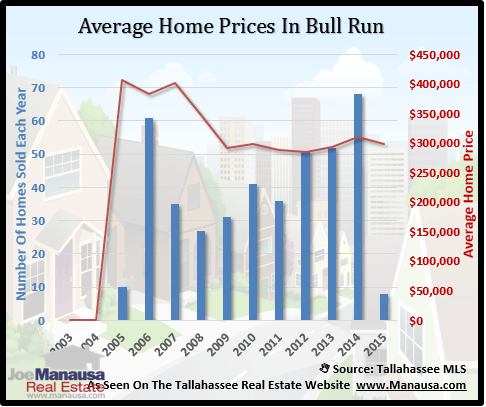 The real estate graph below plots the average price per square foot of homes sold in Bull Run, and a cursory examination would lead us to believe that Bull Run homes are holding their value better than the rest of the Tallahassee real estate market. But when we segment the market between new home sales and existing home sales, then we find that Bull Run home values are falling around the same pace as everybody else. And with this being such a popular NE Tallahassee neighborhood, you would have hoped to see it perform a little stronger. The red line in the graph above records the average value of new homes sold in Bull Run, while the blue line shows resale values. Existing home sales have dropped from $175 per square foot in 2007 to a current level of just $125 per square foot. Now that we are seeing the pricing pressure on new home values (red line), I expect new construction activity for Bull Run Home Builders to decline.